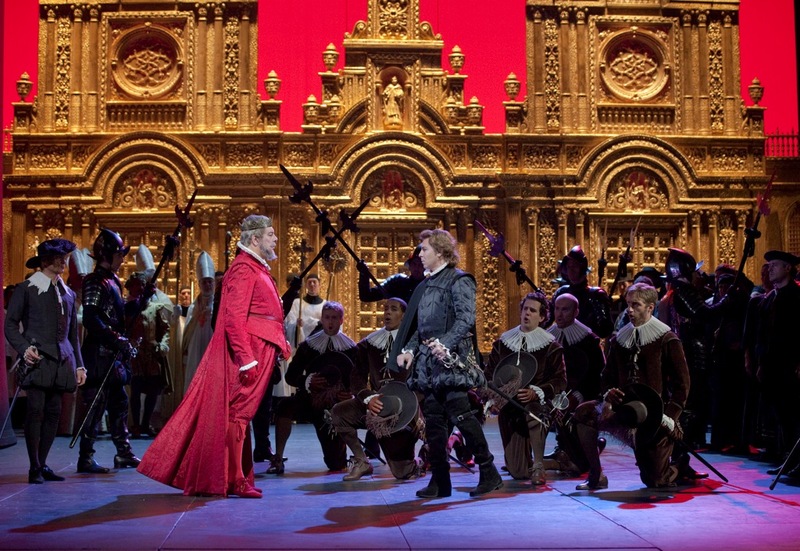 The staging of the Metropolitan Opera’s new production of Don Carlo is a triumph of conservatism. Ironic, when you come to think about it, because that’s the tragic action of the opera too: attempts at reform or even basic human compassion among the court of King Philip II are crushed like so many bugs by the reactionary political arm of the Catholic church. Now, even for a Regiehead like myself, there is a lot to be said for a well-executed conservative (i.e., noninterventionist) production. Hytner manages to leave Don Carlo strictly in the epoch prescibed in the libretto, and at no time (well, almost) does he directly defy the published stage directions. And yet, the drama is exciting and fresh. So, in this case, conservatism is a (if not the) valid approach to take to a classic. In fact, across the sprawling five acts of the hybrid “Modena” edition performed at the Met, only one scene is a dramatic clunker, and even that is passable to look at. But we’ll get to the relatively minor failures of this production later. I’m not going to vouch for what this Don Carlo will look like 15 years from now revived by some assistant who only knows the original from viewing the DVD. But for now, Hytner has created a believable and moving human drama, particularly for Elisabetta (Marina Poplavsksya), Filippo (Feruccio Furlanetto) and, to a slightly lesser extent, Posa (Simon Keenlyside). These three performers were all in the “original cast” version of this staging at Covent Garden, and so it’s not clear whether the greater detail and impact of their acting stems from longer experience with the production, innate talent or the director’s vision. Hytner should be the benefit of the doubt, I think, because even a newbie like Roberto Alagna, nervous as a cat in his first couple of scenes (as well he might be in so high-profile a role debut) held his own in the “Io vengo a domandar” duet. This is a particularly demanding scene for a tenor because he is called on to play such untenorial qualities as hesitancy and shyness. He even has to collapse into a sort of dissociative state at the moment the lady he loves finally seems to be giving in to him. Hytner had Alagna play this moment as if Carlo were overtaken by a gorgeous dream, a vision so overwhelming he lost his bearings in the real world. The collapse was gradual and controlled but still ecstatic, but then the staging took an unexpected but striking turn: as Carlo lost consciousness, he slowly pushed the concerned Elisabetta off balance until she fell too, into a seated position, with her full crinolined skirt billowing about her. She held Carlo in her lap, in a position evoking a baroque pieta. Not only was the image tender, emphasizing Carlo’s frailty, but it also underlined that Elisabetta is both in legal fact and (as we will understand more later) in spirit Carlo’s mother. She is the stronger of the two and therefore she is burdened with the greater weight of responsibility for their shared behavior. But the tableau lasts only a moment: as Carlo regains consciousness, his first action is to make a sexual advance. A subtle shift of weight tips Elisabetta onto her back and Carlo is on top of her fumbling at her bodice. She shoves him away in terror and disgust. With Elisabetta apparently within seconds of being seduced or raped, her sudden extravagant outburst “Compi l’opra, a svenar corri il padre / Ed allor del suo sangue macchiato / All’altar puoi menare la madre” for once sounds fully motivated. This Elisabetta is not a prig, throwing the Oedipus story in her son’s face, but an outraged woman thunderstruck at the potentially disastrous outcome of a moment’s weakness. And speaking of heretics, here’s where I think this really fine production gets a little lost. The auto da fé scene is a problematic anyway (who are we supposed to believe in, all that brass pageantry or the snippet of offstage soprano warbling?) and I think Hytner exacerbated the problem by taking the religious intolerance theme too seriously. Not that religious intolerance wasn’t perfectly horrific in 16th century Spain, goodness knows, but that doesn’t seem to be what the scene is primarily about. Verdi’s letters about the preparation of the libretto of Don Carlos (i.e., the original 1867 Paris version) show that this scene was modeled closely after the Coronation Scene in Meyerbeer’s Le Prophète. This sure-fire melodramatic formula consisted of a more or less festive but always public occasion that is interrupted by a sudden moment of personal (e.g., familial) conflict. In the Meyerbeer opera, the public occasion is the procession into the cathedral in preparation of Jean the prophet’s coronation as Emperor; the personal conflict is sparked when out of the crowd appears his long-lost mother Fidès. Her recognition of the son she thought dead shakes the rabble’s blind faith in Jean’s claim of divine origin, and… scène à faire! Verdi’s librettists, du Locle and Méry, varied the formula here and (at Verdi’s insistence) made the interruption more relevant to an ongoing theme of the opera, Don Carlo’s growing interest in the plight of oppressed Flanders. At the moment of Filippo’s coronation, as the people cry “Gloria a Filippo! gloria al ciel,” Carlo bursts into the public square with a gaggle of Flemish deputies, hoping to shame his father into granting him authority over Flanders. The auto da fé, then, is more or less a background event, a ceremony to be interrupted by the more dramatically important plea for Flanders. But Hytner takes his cue from the Voce dal Cielo (and, to be fair, Verdi does give her the last word), shoving to the foreground the ugliness of the Inquisition. The prisoners are dragged across the square repeatedly, hissed and spat upon by the populace, clubbed and poked with spears. After the Filippo/Carlo conflict is resolved and the festivities resume, we are treated to a quick, shocking glimpse of the charred corpses of the heretics, revealed upstage of a scrim painting of the face of Christ. There are two problems with all this focus on the victims of the Inquisition. The first is that there is no appropriate music for dragging prisoners. The march Verdi wrote is so suave that it can pass back and forth between offstage brass and the massed strings in the pit easily. In order to create a sense of menace, Hytner is forced to interpolate cries from the crowd, grunts from the tormented heretics, and even spoken dialogue from an invented lead inquisitor. In the context of what is otherwise a conservative, noninterventionist production, this is jarring; it feels like something interpolated from another show. The second and more important issue here is that by bringing onstage the Inquisition that Verdi and his librettists leave offstage, the central dramatic action of the scene is eclipsed. The plight of far-off Flanders seems relatively trivial when only yards away human beings are visibly being burned alive. And so Carlo’s act, which is meant to seem essentially noble and altruistic (if poorly thought out), looks like rank stupidity. That leaves the noble Posa, who egged Carlo on (then had to rescue him when the demonstration went south) looking like a fuzzy-minded meddler or worse. Now, it’s not impossible to take a more critical or even satirical view of the auto da fé scene, but to my mind that works better in the context of a more interventionist production: for example, Peter Konwitschny’s deconstructionist Don Carlos performed at the Vienna State Opera in 2008. The burning of heretics, he suggests, is a red carpet event, complete with live television coverage and paparazzi. When Carlos hijacks the media coverage to broadcast his (carefully staged) protest, the dramatic focus lands not on the political but the personal: Phillipe’s pique and Carlos’s heartbreak at Posa’s change of allegiance. The reason a reading of the scene so at odds with the libretto can work is that the director has from the beginning of the opera avoided any conventional naturalism: the drama transpires in a purely invented world in which anything can happen. In the more conventional action presented by Hytner at the Met, even a mildly free handling of the text can feel like the taking of a liberty. Photographs: © Ken Howard/Metropolitan Opera. This entry was posted on Thursday, December 2nd, 2010 at 4:35 pm	and is filed under Rough and Regie. You can follow any responses to this entry through the RSS 2.0 feed. Both comments and pings are currently closed.